As parents, professionals and generally busy people, we know technology is moving quickly. Pinterest is all the rage, newscasters are quoting Twitter, and our kids are sharing “selfies.” How’s a respectable adult supposed to keep track? This course brings you up to speed on the fast-changing world of social communication. You’ll learn the difference between a Tweet and a text, what a #hashtag does, and how to protect your privacy – without being overwhelmed. This class is an introduction to the most popular social networking sites, along with some you haven’t hear of (yet). 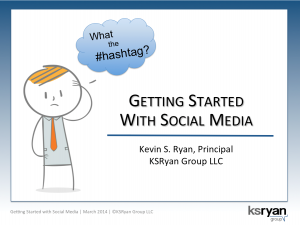 This course was last taught by Kevin S. Ryan at Hofstra University Continuing Education in March and April 2014. Free downloads are available to registered students for a limited time. Want a program like this for your organization? Contact us.